Certainly old, but not as old as the date on the inscription would suggest. Exeter Art pottery was set up by two potters, Cole and Trelease, in Exeter in the last decade of the nineteenth century. 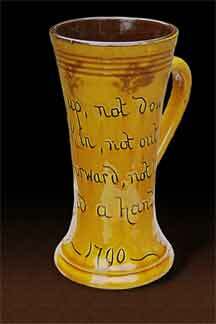 They made mugs and jugs, usually bearing a quotation and a date. The date might allude to the quoted text, or was possibly plucked from thin air. The pottery ceased production in 1896 and the premises were taken over by Hart and Moist for their Devon Art Pottery.